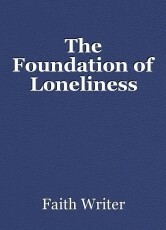 What is the foundation of loneliness? The sound of loneliness is difficult to describe because so many people experience loneliness, yet the experience can be different. So I will say from my experience with loneliness the sound that it makes is some sort of static. The static that cancels everything out, because why hear a noise when you are trying to close out the noise of what is going on around you. The color of loneliness is white. White is a perfect color for a feeling that makes you want to sometimes disappear. It does seem fitting that the white crayon is overlooked until its needed because of that we all feel overlooked by those who say they care about us. The smell of loneliness is different for everyone. Loneliness can smell sweet and it can smell bitter, there can be different experiences with it. The foundation of loneliness can be different including the sounds, color, and the smells. Because it depends on how people view loneliness do they enjoy having time by themselves, or do they purposely exile themselves? An interesting idea, really. Thanks for the unthinking question at the end, now I've got something to ponder! I'm comfortable alone, comfortable in silence....it's when I have to step out into a society that I simply don't fit in that the loneliness hits hard. You put a lot of thought in to this, Faith. I picked you apart, and I'm sorry.